The ODI Leeds & Friends Showcase landed right in the middle of the Leeds Digital Festival, and was a great opportunity to show off — the various projects we've helped or facilitated, and the pioneering people doing interesting things in Leeds. 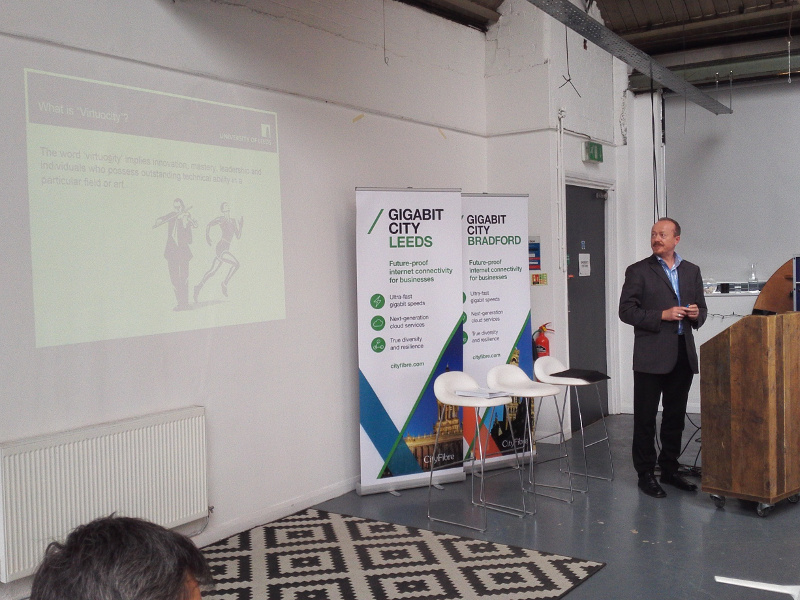 The day was kindly sponsored by City Fibre/Gigabit Leeds, so conversations and new connections were made over sweet treats and fab food. 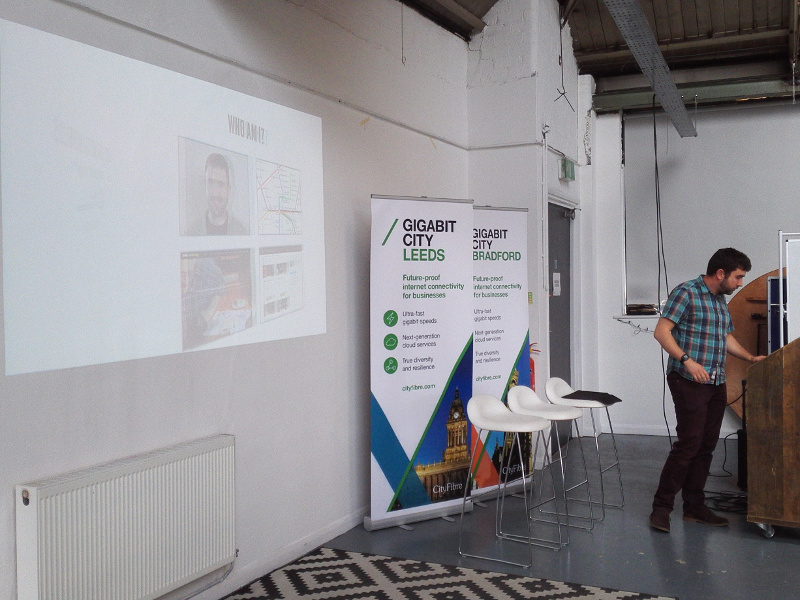 Neil Hamlin was the first speaker of the day, setting us all up with a rousing talk about Leeds being a leading city for the digital industry...but having poor communication infrastructure. Much of the broadband is still provided over copper wires, many of them laid decades ago. 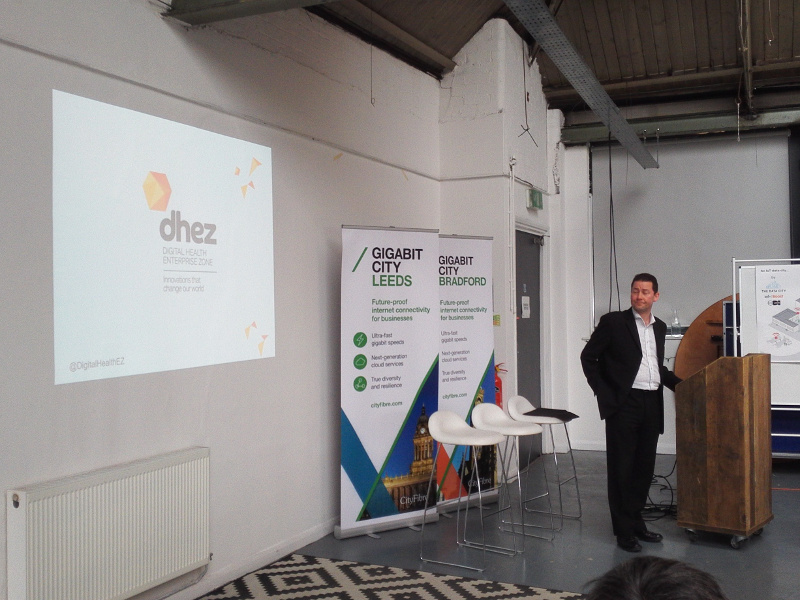 City Fibre aim to create Gigabit Leeds — a brand new dedicated network of fibre cables, free from older infrastructure. 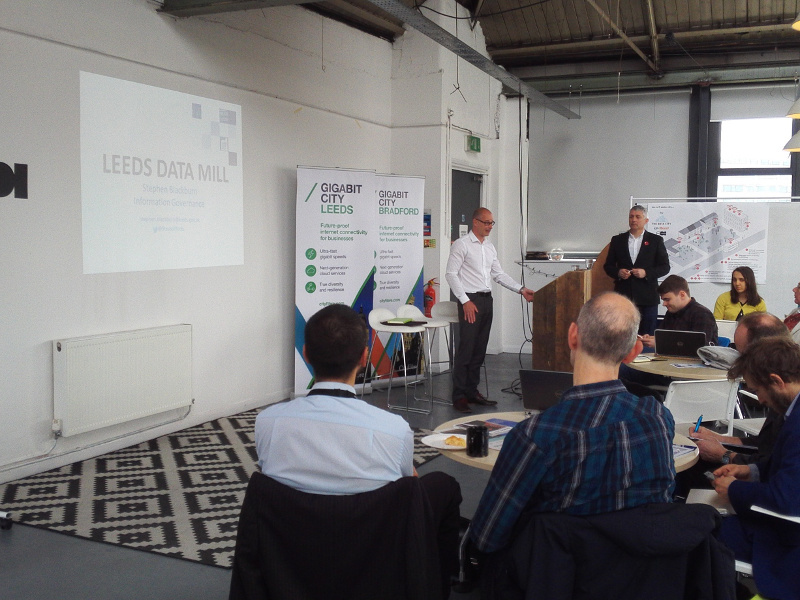 Stephen Blackburn was up next, talking about the Leeds Data Mill. 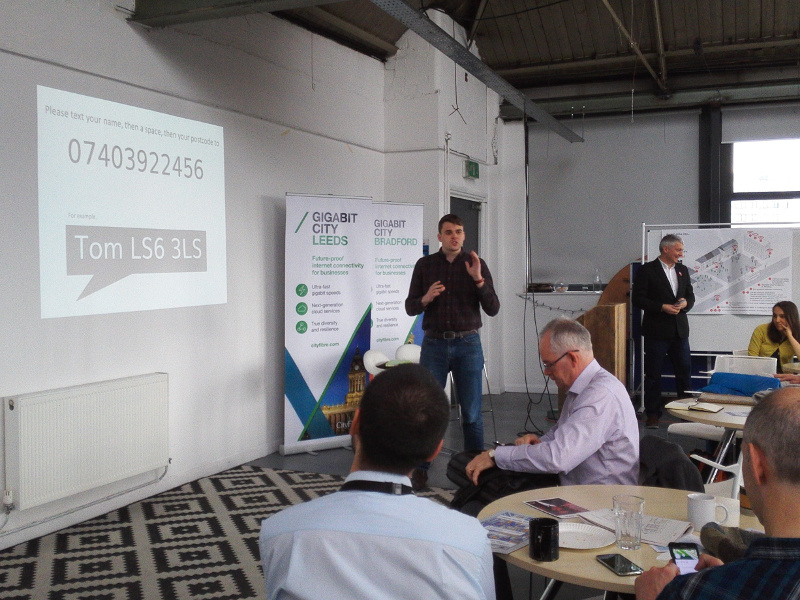 Working with Leeds City Council, the Leeds Data Mill aim to publish datasets about the city, and have been very busy since their inception in 2014. To date, they have over 250 datasets and Stephen is ambitious — he wants to keep publishing more data and do it well. It's not exclusively Council data either, with more organisations getting on board and embracing open data. 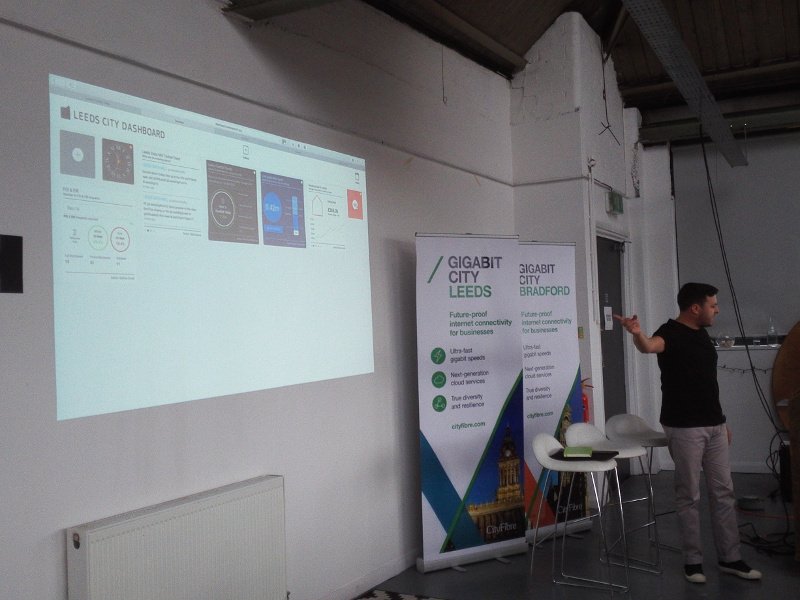 The datasets have powered some innovative pilot projects, working with the likes of Hebeworks, Yorkshire Water, and Leeds City Council. For Stephen, the Leeds Data Mill is about people — using data to power solutions that will ultimately make people's lives easier, better, happier. Mark Birkin took to the lectern, keeping his talk very low-tech — not a presentation slide in sight. LIDA currently has two focused programmes for data research: medical bioinformatics and consumer data. Mark is hoping to channel the consumer data into more academic research in the future and given the kind of data they work with — supermarket loyalty cards, travel smart cards, smart meters for utilities — there is a lot of potential. Kathryn Grace and Matt Edgar were next, armed with...well...stick people! Masters of service design and creative problem solving, they started their talk with some inciting questions — "What comes to mind when you think of design?" and "What comes to mind when you think of service?" Most people do not put service and design together, but that is exactly what Stick People do. They are a big advocate for learning by doing. They also organise Leeds Gov Jam, which will be held for a third year at ODI Leeds. Excitingly, Kathryn and Matt will be involved in Global Gov Jam at the same time, running their contributions right here from Leeds! Simon Zimmerman from Hebeworks was next, and here to talk about the work they have done with open data that has lead to their still-evolving self-service Solomon dashboard. The seed for Solomon began with The City Talking, the local newspaper that Hebeworks produce. Starting in Leeds, The City Talking is now distributed in Sheffield, Manchester, York and Liverpool with local content. Moving to mobile was a natural progression but Hebeworks didn't want to just have a digital version of the newspaper. 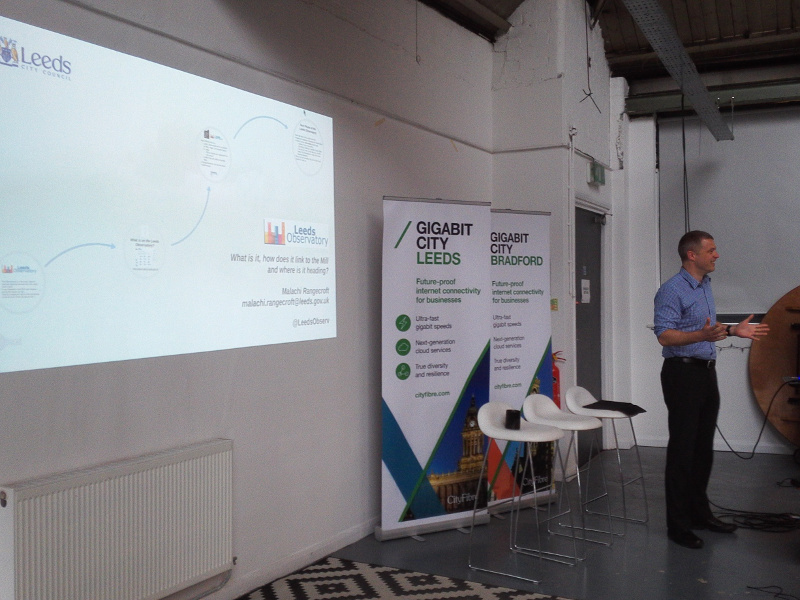 The first prototype used footfall data from Leeds Data Mill in relation to other data, such as weather, football fixtures, etc. They then trained an algorithm to predict how busy Leeds might be on certain days, based on factors like events and weather. The ultimate aim of Hebework's efforts with Solomon is to make data useful for people who don't know data. A working prototype can be experienced on the mysolomon.co.uk website. 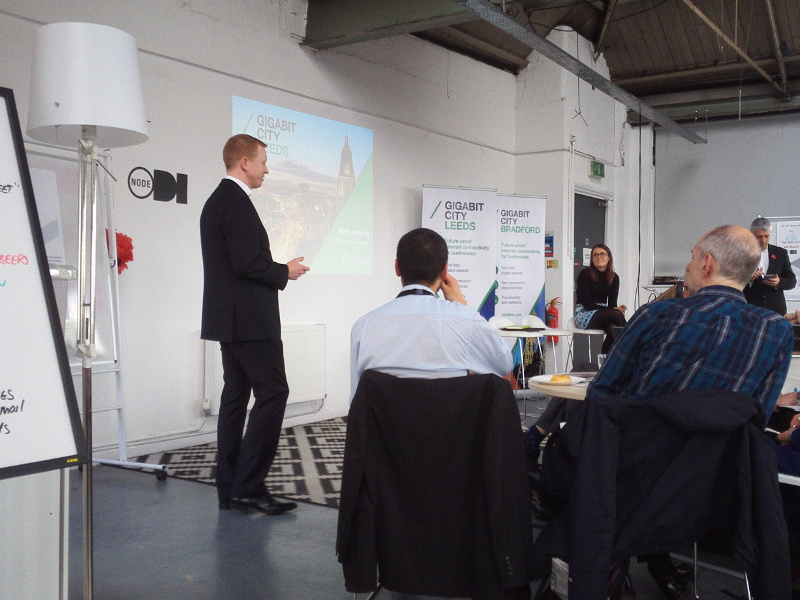 Next was a talk from Thomas Forth, Head of Technical Challenges and leader of the ODI Leeds challenge team.. In such a short space of time, he managed to talk about his work at his company Imactivate (augmented reality books Rusty the Robot and Cosmology) and the prototypes and projects that have used open data from the Leeds Data Mill. Tom is a big believer in doing things locally first. A personal project of his — mapping child poverty in Leeds constituencies to university admissions — caught the attention of politicians on Twitter after he expanded it to cover the whole of the UK. Tom has also worked on Leeds Empties [link], sparking several branching projects, including the 'Parkulator'. Using Open Street Map data about parking space in Leeds, Parkulator shows you what else the space could be used for. For example, the space of the brewery car park alone could equal 640 homes at London density, or 10 green parks the size of Park Sq in Leeds. Tom's presentation can be found on Slideshare. Jamie's presentation can be found on Slideshare. James Smith rounded off the morning talks with a run-down of what the ODI Labs do and some of the projects they have worked on recently. ODI Labs are responsible for the technology that enables open data use. They work on tools, standards, techniques, infrastructure, and can advise on data discovery and integration. They've made a range of tools available for checking data and continually work on software prototyping for a variety of uses. They have recently collaborated with Transport for London, using tech like Raspberry Pi, to record the weight of carriages on Underground trains. It showed when some carriages were busier than others (they were heavier, hence the weight recording), which could have massive benefits on the platform during rush hour. Imagine station staff being able to advise people on the platform about which carriages were already full, or which carriages were expecting a mass exodus onto a crowded platform. 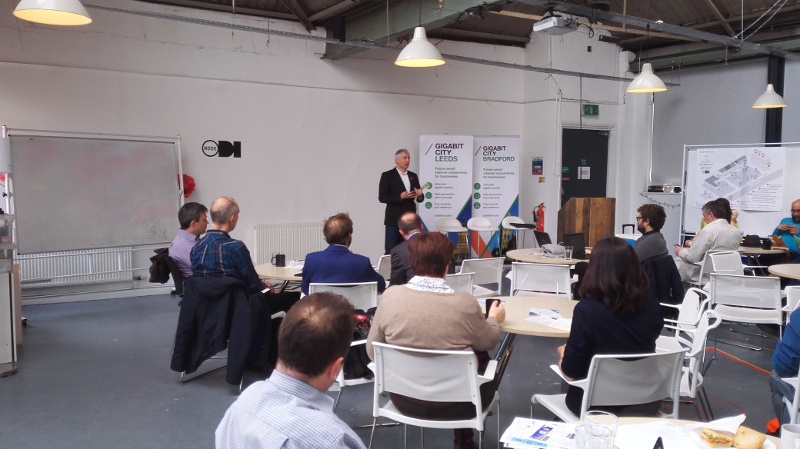 Paul reminded us all that "We are doing Pioneering Work" where Open Culture, Open Innovation, Open collaboration are business as usual for our Sponsors, local members and our network. 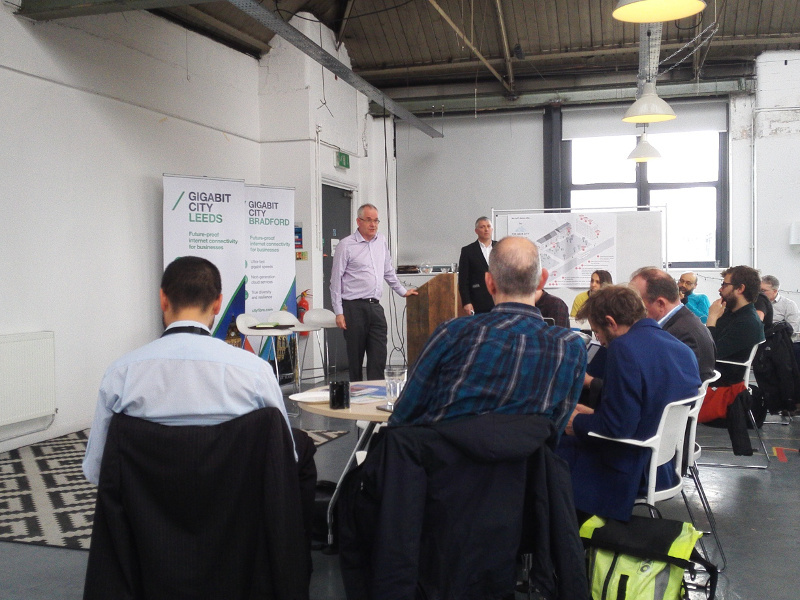 In his view "Leeds is perhaps the best place in the world to innovate with Open Data". 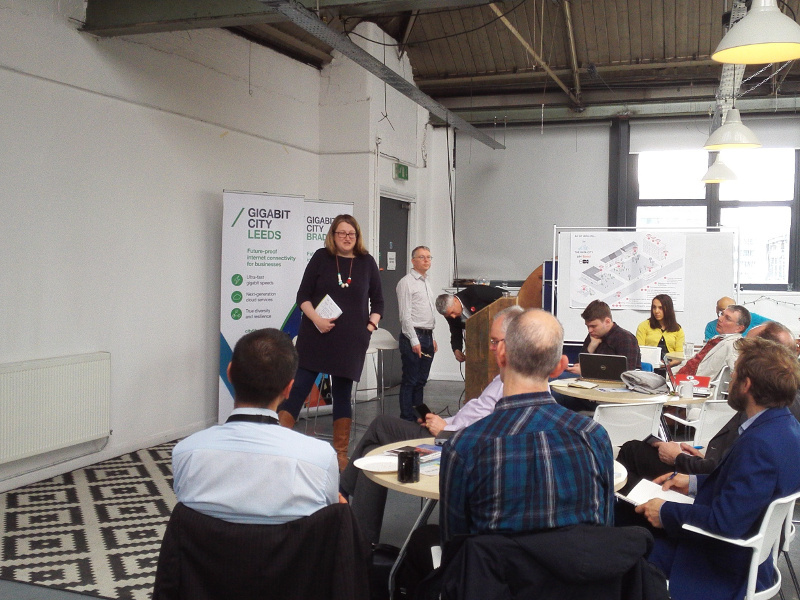 "Data and Digital cuts across all aspects of our lives, all businesses are now digital and we see everyday here at ODI Leeds a glimpse of the future, where innovating with data can make a difference to how we live, how we play and how we build a future. We are regularly contacted by National policy and research bodies asking us how we are doing this? The subtext being and you're not in London and you're in the North and you're managing to do this ? — then we tell them we receive no direct funding, are supported by projects, the support of sponsors and our network, that again surprises people, our subtext being we've already built the thing you're researching so how can you help us amplify what we've built so far. As an example I give is the Call by Eddie Copeland of Nesta's Innovation Lab, for a London Office of Data Analytics post here - with an offer of Nesta's help. 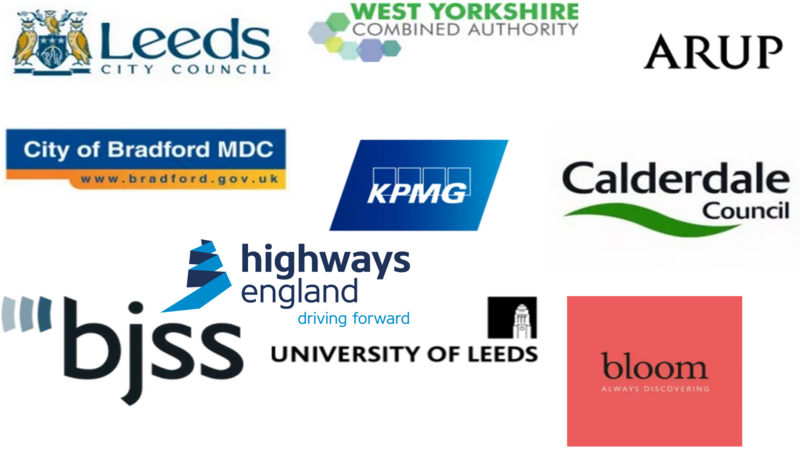 When all the ingredients — capacity, capability and perhaps more importantly the commitment and support of the Public & Private sector, are present in Leeds. We can do this now at a city scale similar to most across the world and then we can share the learning with London. Support us now and you'll have the Leeds Office of Data Analytics next month and the London office by January 2017. To close I'd like to remind you that we are still only 2 years old and what we are doing is unique, certainly in the UK and perhaps globally, we've made good progress so far and thank you all for your help, please enjoy the rest of the afternoon talks, remember to have fun and come to our events on Friday — Algorave Leeds with Live Coding & Visuals and a loud PA — and Saturday Enchanted Objects with Playful Leeds. I'm speaking at Glug Leeds tomorrow night and here are my slides. 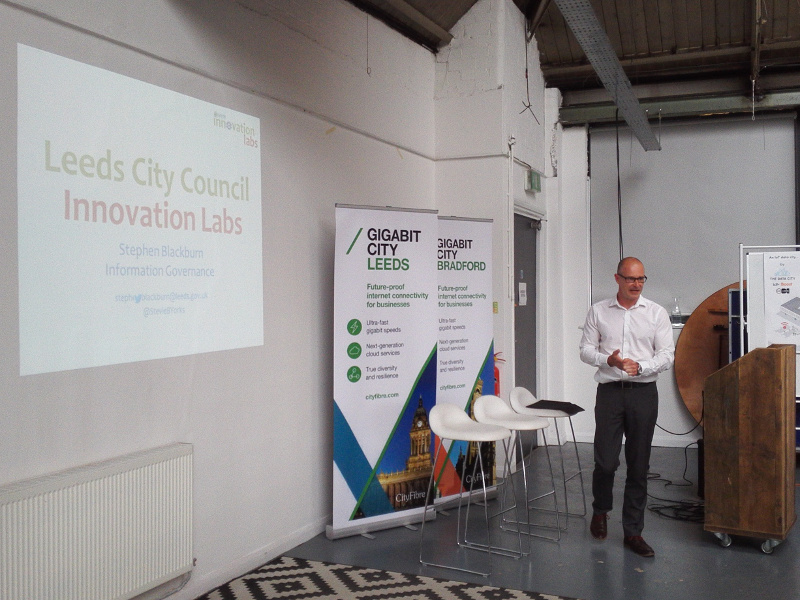 Stephen returned for the second of his talks, this time focusing on the Leeds City Council innovation labs. There have been successes, and there has also been a steep learning curve. Some of the barriers to getting organisations to open up about data include 'why should I release my data?' and 'what good will it do?' and 'how will it get used?' Another frequent obstacle is how data has been recorded. Some of it may well be quite old and analogue, and needs some time and care to make it suitable for open data use. 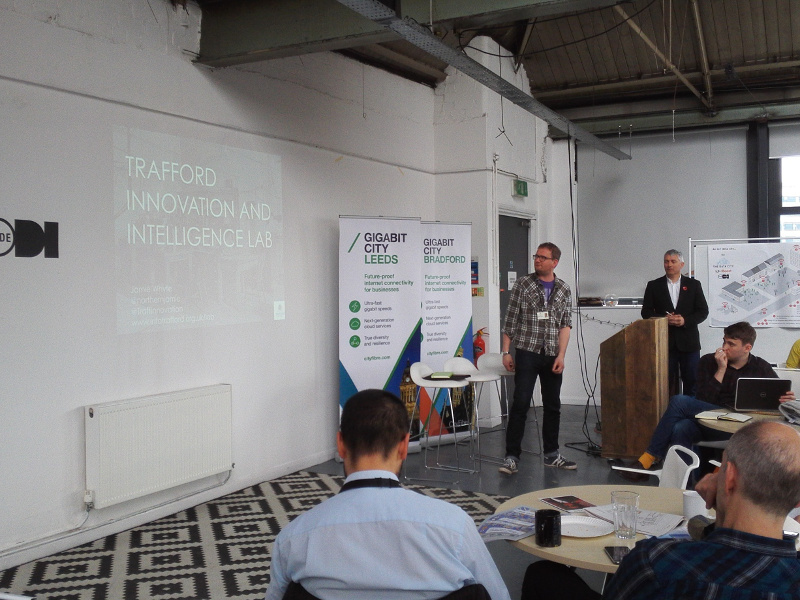 Stephen still believes innovation labs are an ideal way to connect with local developers, designers, analysts, community-builders, etc. He welcomes people from different backgrounds and experiences because they can often look at a problem from another angle. Switching things up from presentations, Rich from Fish Percolator demonstrated how much Ruby loves data with some live coding! When he said 'Excel is terrifying' I think everyone gave a knowing chuckle. He explained the advantages of using code for data access — the process could be automated, allowing new data to be fetched on a regular basis, and complex queries could be performed easier across datasets. It also feels cleaner, not requiring folders and folders of CSV files. If you're interested in his method, he has a fab post on Medium all about it. A last minute addition to the talks, Paul Chatterton managed to squeeze in before a quick coffee break. Borrowing a marker and a whiteboard, Paul laid out the approach they used in urban future projects — civic engagement, co-production, and social action. He was looking to make connections and encourage collaborations, with some specific ideas including a way to work with commons space and 'codifying' a concept for community-led housing. Leeds Observatory is a little known but no less powerful addition to the growing Leeds data family. Rather than specialising in releasing data like the Leeds Data Mill, the observatory transforms stats into information — it's less about raw data and more about what the data says. Malachi demonstrated this by choosing a subject, i.e. deprivation, and generating a report. Graphs and tables with the information applied to them and colour-coded for extra clarity. Some subjects can even be loaded onto a map. 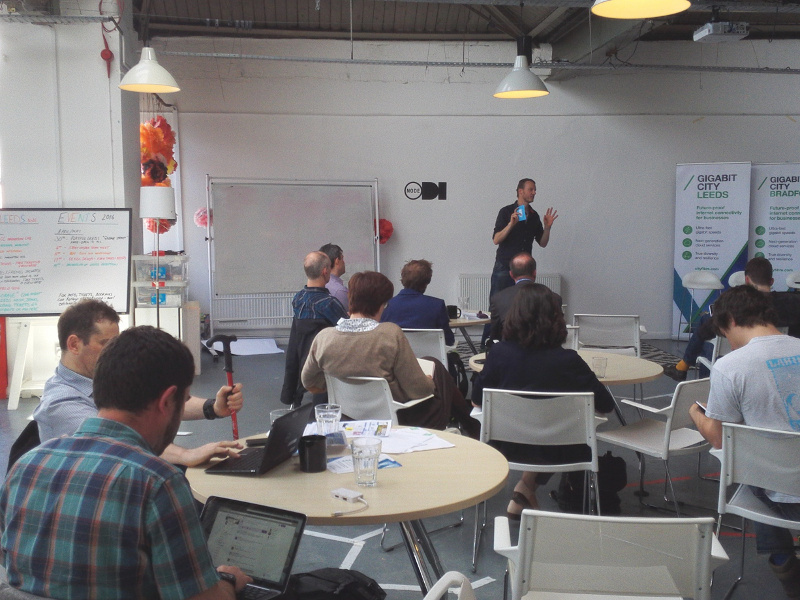 Malachi was looking for collaborators, with a view to moving raw data to Leeds Data Mill, and making the observatory more accessible for a wider audience. Crispin, kindly stepping in for Dan, was up next, to talk about Drupal. It is a content management system like Wordpress, and whilst it might not be as widely known, it garners a lot of love within its community of users and developers. It is open source, meaning anyone can work towards improving it and everyone shares in its successes, and it can be quite robust, acting like a framework for bespoke uses to be built upon. Crispin highlighted that the latest Drupal release has even more support for API use and could work really well with open data. 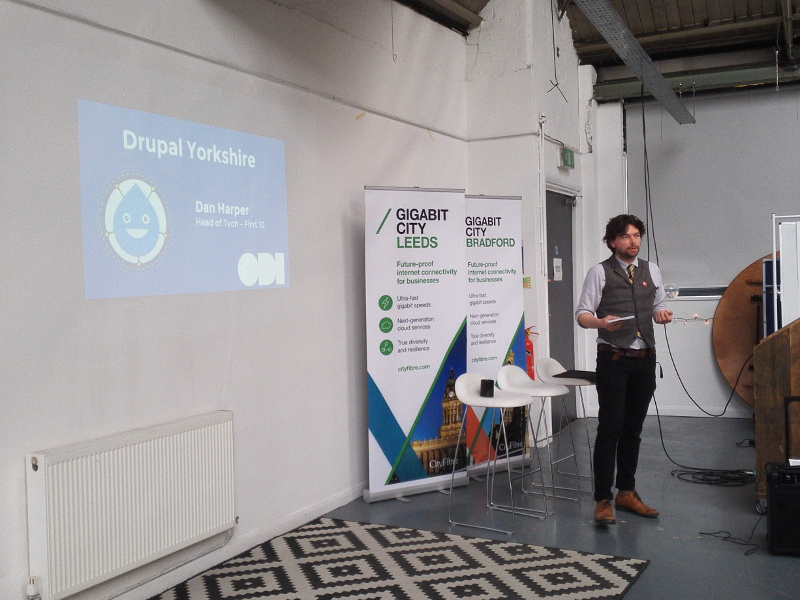 He briefly spoke about the meetups (Drupal Yorkshire is held right here at ODI Leeds) and emphasised that you don't have to be technically minded to join in. They welcome users as much as developers. And lastly, Crispin announced plans for summer Drupal apprenticeships. Aimed at recent graduates looking to expand skills and develop good working practice. The last talk of the day fell to ODI Leeds founder Paul Connell and the other side to his life in data. 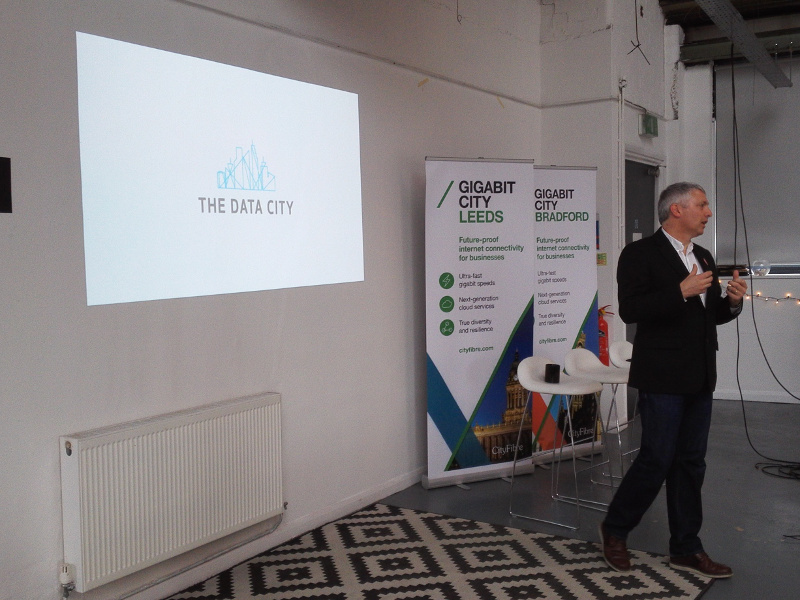 Data City represents Paul's ambition to lead the way in solving problems with data-driven solutions, starting with Leeds as the platform for change. These solutions can then be developed further into products or services that can be repeated across the country, and beyond. It's about controlling your data and getting results that matter and are meaningful. Digital business is such a new sector and doesn't fit into a tickbox on a registration form. 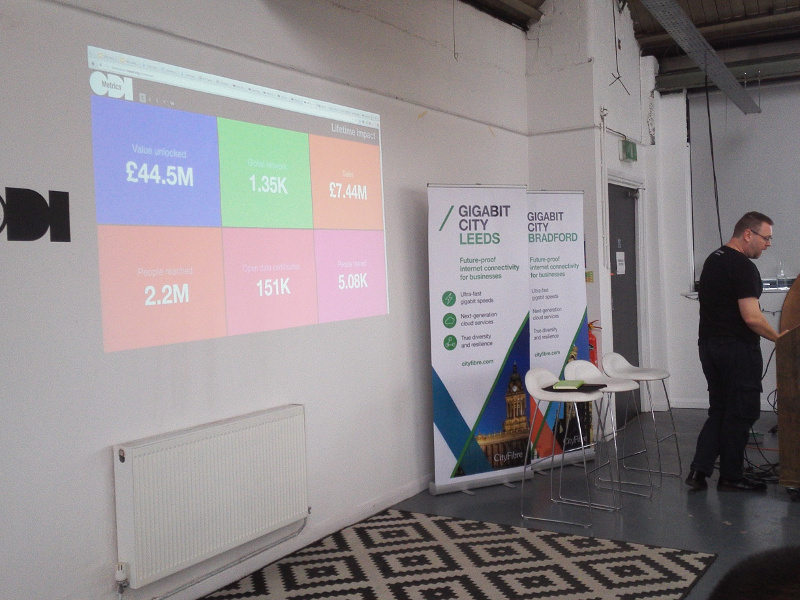 This data provides more information about the business environment in Leeds, and where things like investment in communications would be well placed. An example of local data leading the way first.